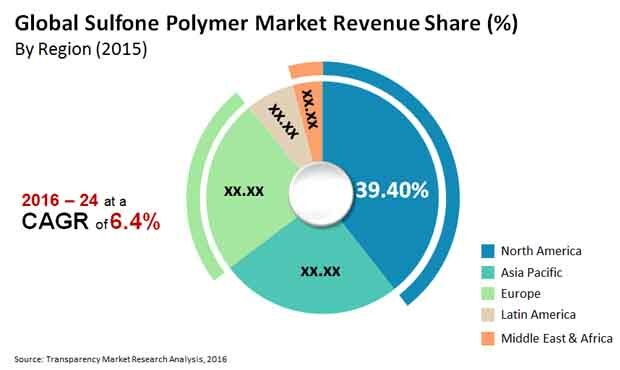 The global market for sulfone polymer has highly consolidative vendor landscape, Transparency Market Research (TMR) observes. The leading companies such as Solvay S.A. and BASF SE are accounting for major share in the global market for sulfone polymer. These players are increasingly take part in strategic collaborations in order to acquire substantial share and remain dominant in the overall market. Other leading players operating in the global sulfone polymer market are Sumitomo Chemical Co., Ltd., Uju New Materials Co. Ltd., and Sabic. These players are also adopting some strategies such as collaboration and product innovation for expansion of market and improvement in production capacity. According to TMR, the global sulfone polymers market was valued at US$805.4 mn in 2015 and expected to expand with a CAGR of 6.4% over the forecast period from 2016 to 2024 to attain value of US$1.39 bn by the end of forecast period. Based on the application, medical sector segment dominated the global market and accounted for 24% of the overall shares. Based on the region, North America accounted for the leading share in the global market of about 39% of overall market in 2015 owing to the presence of key industries in the region. Sulfone polymers are rigid plastic transparent materials. It remains transparent in high temperature up to 204°C. The material offer high heat resistance, oxidation resistance, and thermal stability to various the electric and electronics products such as aircraft radomes, printed circuit boards, and connector’s blocks. The characteristics such as hydrolytic stability and heat absorbing properties are making them as preferable for medical and food application. Additionally, the material is known for its properties such as toughness, creep resistance, and low level of shrinkage. These properties are propelling adoption of sulfone polymers which is likely to fuel growth of the sulfone polymers market. Demand for the sulfone polymers is rising substantially from the end use industries such as automotive and aerospace industries as the material meets the requirement of high quality plastic which is stable and bearable to the high temperatures. Many type of commercial material such as polyphenylsulfone among other is witnessing higher demand from these end use industries as the material has high impact strength and toughness. These factors are positively influencing on the growth of the market. The trend of the using low weight material mainly in the aerospace industry is boosting its demand and this trend is expected to propel its demand over the forecast period. This trend is expected to augment growth of the global market for sulfone polymers. Despite these growth factors, the stringent regulations imposed on the BPA is likely to hinder growth of the market. Furthermore, in some medical and food applications, the government has disapproved usage of the sulfone polymers in order to maintain food quality which is another factor limiting growth of the global sulfone polymers market. The factors such as high maintenance and manufacturing cost is also limiting growth of the market. Nonetheless, higher R&D investment for product improvement is expected to offer lucrative opportunities for growth over the forecast period.